Here is the truth that seems to be eluding many enthusiasts of weight loss … calories are not little nuggets in your food that can be counted by your finger tips and eliminated with a pair of tweezers. So, when you have to ensure ‘counting your calories’ for the sake of losing thick blankets of adipose enveloping your physical self, you will have to measure the portions of food that you eat instead. To maintain your diet does not mean resorting to healthy greens and fresh fruits with a dash of lean proteins only. The quantity at which these components of a healthy diet are eaten makes a massive difference to your diet plan. Say for example, if you eat way too much of even the leanest of meat or lightest of fruits, you will end up inflicting excess calories on yourself which again, is sure to add to your weight than subtract from it. Point to Note – Before attempting to measure with any technique among the mentioned options, it is very necessary to enlighten yourself about ‘how much’ you have to eat in the first place. Say for example, if you are aged between 18 to 30 years and exercise moderately, you should eat about 5.5 ounces of lean meat every day. Proceed with measuring the portions once you are sure about how much of food you should consume to avoid gaining weight. 1) Measuring cups – This is one of the safest and the most reliable ways of measuring portions. The cups usually come with gradations that display quantity of the food in grams, ml, ounces etc. Choose the one that you are comfortable with and get ahead with the measuring process. 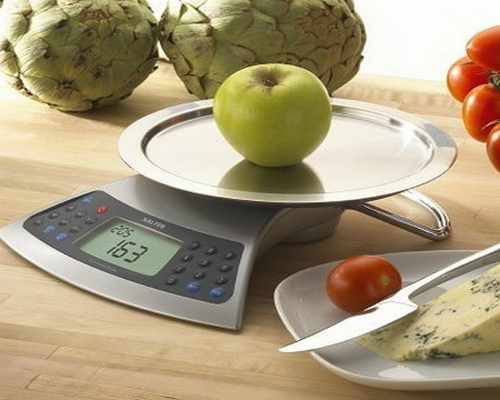 2) Weighing in weighing devices – While this is also a very potent way of measuring your portions, it could get a little tiring sometimes. Taking the dry weight of your plate, then loading it and measuring again and repeating the process, say, about 5 times a day can get the better of you. If however, you have a kitchen weighing device available already and are willing to take the pains for the sake of your cause, this could work massively in your favor. 3) Measure with your hands – Measuring portions using your hands can be of great help only if you can understand the basics right. This can be of immense use while eating in places where you cannot carry your measuring devices to. 4) Go by your instincts – This process of measuring portions could take a while to master. Eating by your instincts is how nature had planned it in the first place. Eat as much as to satiate your hunger and that too with healthy unadulterated food was the whole plan. This simple yet effective strategy was claimed later by the assault of factors like greed for taste, binge eating to counter stress / depression and matters of the like. If you can keep these factors from affecting your diet habits, you could go by the way of nature and trust your instincts for the purpose.